War is Boring: Bored Stiff, Scared to Death in the World’s Worst War Zones has considerably dashed my dreams. It’s not the violence, the disturbing imagery that a war reporter must bear witness to. It’s not the lies, the cynicism, and the amoral opportunism that thrives in war zones. It isn’t even the brushes with death. 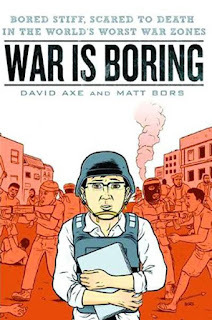 No, it’s exactly what the title warns: War is often boring. But, what’s worse is that returning from war, reinserting oneself in the normal world, into peacetime, is even more boring, according to David Axe, war reporter turned comic author. First off, War is Boring isn’t reportage in comic form. Rather it’s a comic book about being a war reporter and the difficulties experienced coming back from war. The story is comprised of a series of vignettes tracing Axe’s experiences in East Timor, Lebanon, Iraq, Afghanistan, Somalia, and Chad counterbalanced against his returns home to South Carolina and Detroit. Stateside, Axe experiences a deep ennui and impatience with normal life: parties, girlfriends, having a burger, going to weapons trade shows. A war junky, he’s drawn time and again back to war. It doesn’t matter which war, so long as people are shooting one another (or throwing spears in East Timor). The problem Axe finds is that war can be almost as boring as life back home. His time in the field is spent waiting for something to happen. He often arrives too late: the war’s over, all that’s left is the scars and memories. Axe’s life seems to be one of chasing after something he only rarely finds -- and fending off the pleas of local fixers seeking a American visa. The comparisons between War is Boring and Joe Sacco’s work is pretty much unavoidable. Axe is an accidental comic writer -- journalism is his main gig -- whereas Sacco is a comic artist doing journalism. But, both have an abiding fascination with war and conflict. War is Boring isn't as expertly crafted as Palestine or Safe Area Gorazde, but it’s a good read nonetheless. The similarities with Sacco’s oeuvre extend to Matt Bors artwork, at least at first glance. Upon closer inspection, Bors work is rather subdued in comparison to Sacco's. Bors favors clean lines and routine angles, excentuating the theme of the banality of war reporting, even of war itself. If there’s a drawback to this book, it’s that Axe doesn’t seem to go deep enough into exploring his “war fix.” Indeed, Ted Rall’s introduction offers much more of an actual analysis of this condition. But Axe’s limited exploration of his war addiction is perhaps the point: there’s nothing much to it, it simply is the way things are for the author. The extremes of boredom in war and boredom in peace require no further explanation or elaboration. This is something that only a war correspondent would understand. Maybe the war fix is like jazz. I’ll probably never get it. Nerd coefficient: 7/10, "An enjoyable experience, but not without its flaws"